SinglesFly - Date On The Road. This page allows the user to find opportunities for scheduling dates. This page will show all the members, who’s home base is within 50 miles (of the user’s), who posted public itineraries and who’s destinations are within 50 miles of the user’s destination, provided that the trip schedules overlap, at least by 24 hours. 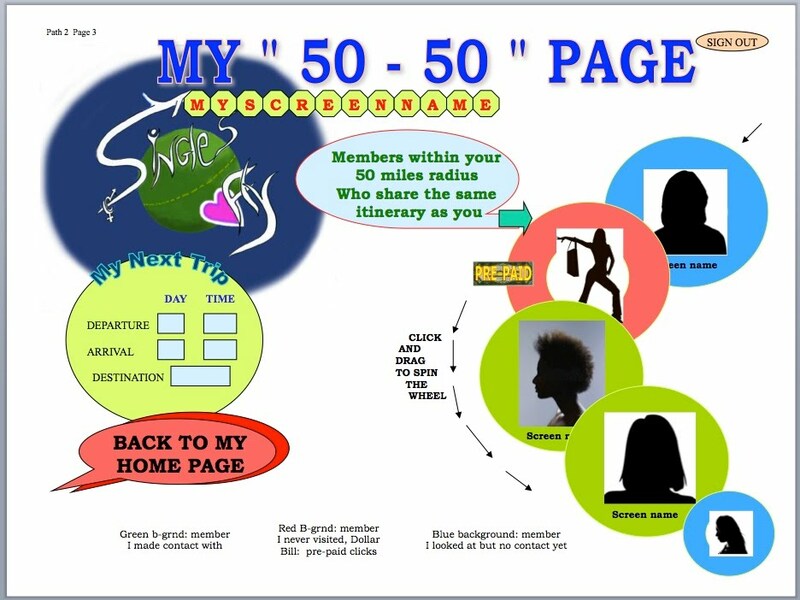 It means that both the user and the member in the 50-50 group, will spend, at least 24 hours in the same 50 mile radius. When any member, who’s home base and destination, are within 50 miles of yours, posts their travel itinerary on “singlesfly.com” and chooses to make it public, their screen-name will automatically show in a user’s 50-50 page. As with the “incoming clicks” page, the members will appear on a spinning “big-wheel” to the right of the web page. The wheel of members does not spin automatically. It is up to the user to spin. As described in the “incoming clicks” page description, the members’ photo and screen-name will be displayed on a circular background which is red, green or blue. (see page 19). as in “incoming clicks” page, this page will display a schedule of the user’s “My Next Trip”.